done. – my books. my life. I will not post my thoughts until others have had a fair chance to read it. However, if you would like to discuss privately, let me know. And now I can fully reenter the world again. Wow! This is wonderful! I am yet to get my copy of ‘Mockingjay’ and I haven’t yet read the first two volumes of the series, but I am hoping to do that soon. 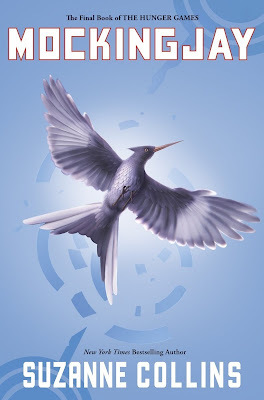 I really missed reading ‘Mockingjay’ with everyone else at the same time – it feels that I am at one with the universe when I do that 🙂 I did it when the last Harry Potter volume came out and when the most recent Dan Brown book came out. Looking forward to review, whenever you feel ready to write it. By the way, how is Ben? His blog ‘My Deck of Cards’ seems to be quiet these days. I’m in an annoying predicament with this one, I’m first on the list for it at the library, but I was going to rush out and buy it when it was released anyway because I didn’t think I could wait. Then I was too sick to do that. It still hasn’t come into the library and I really want to read it but I don’t want to buy the paperback version, I want the hardcover which I can’t find in stores here. So by the time I have ordered it from TBD the library copy will have come in. So I’ve just resigned to wait for the library copy and buy a hardcover from TBD later. Long and boring story I know, but it’s had a lot of thought go into it the past few days! Plus the paperback cover is so ugly compared to the hardcover. So you only have the paperback available on Australia? That’s so odd to me. I don’t even think the paperback of Catching Fire is out in the US yet.